The Women’s Vista Knickers from Castelli are 3/4-length cycling tights featuring Pro Dry two-layer construction -- moisture-wicking fabric on the inside and stretchy nylon on the outside. Cross-wrapping at the waist and leg openings enhance fit. 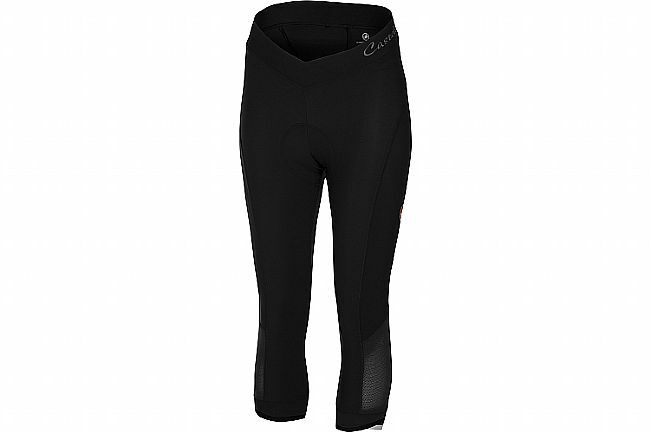 KISS Air chamois provides lasting saddle comfort. I usually stick to wearing bib-style shortsleggings. But these knickers are great so I don't have to get half undressed on a cold day when I've got to stop for a nature break. They are thinner so they won't keep me warm in colder temps, but I love them for those in-between temps. The chamois is super comfortable, and since they are Castelli, they just look nice. Castelli can sometimes run small, but I found the size Small to fit me nicely (I'm 5'2 and about 120). Castelli costs a bit more than some other brands, but is totally worth it. Nice quality, flattering styling, chamois is great. They run small, so order a size up.